Kultura, since its launch several years ago, have been a favorite haunt of my sisters and I. Selling different kinds of Filipiniana items, they stock more than the usual tacky tourist souvenirs. There are a lot of chic homegrown products made with indigenous materials that made Kultura a favorite stop of ours whenever we’re shopping for gifts to give to friends and relatives abroad, or even for those living in the Philippines. One of Kultura’s latest products, I was pleased to discover, were these cute eco bags. The bags are made of canvas and comes in different designs. I hoarded the ones printed with Manila, Aling Nena’s sari-sari store and of course, the face of the coiffed one. The bags are sadly, small, specially compared to Mama Earth’s huge reusable bags. It’s like it’s geared more for toting around, not for carrying stuff from the stores, as ecobags are initially designed for. But at prices ranging from Php 129 to Php 149, and with such fun prints these aren’t too bad. Wow…an Imeldific eco bag without the Imeldific price tag. That would make a great statement on any street. 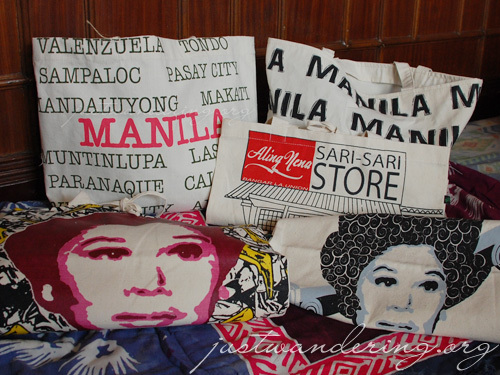 Oh I really like these; thanks for introducing me to Team Manila (cool notebooks) and Mama Earth bags (lovely bags! ), I think they’ll be the perfect souvenirs from Manila.